Happy Birthday Miss Jones, a Norman Rockwell painting, appeared on the cover of The Saturday Evening Post published March 17, 1956. This is another timeless favorite of Rockwell collectors, a classic for all the ages. This painting was Rockwell's 289th overall out of 322 total paintings that were published on the cover of the Saturday Evening Post. Rockwell's career with the Post spanned 47 years, from his first cover illustration, Boy With Baby Carriage in 1916 to his last, Portrait of John F. Kennedy, in 1963. This was also the first cover for The Post in 1956. In 1956, there were five Norman Rockwell Saturday Evening Post covers published. The original oil on canvas painting is part of the collection of film maker George Lucas and was on display at the Smithsonian's Museum of American Art in 2010. A pencil on joined paper study of the painting, also owned by Lucas, was also on display alongside the original painting. on page 208 of Norman Rockwell, A Definitive Catalogue by Laurie Norton Moffatt. One study also appears in the Norman Rockwell Catalogue on page 208. In this painting, Norman Rockwell captures the fondness that exists between teachers and their students. This painting has a lot of elements going on. 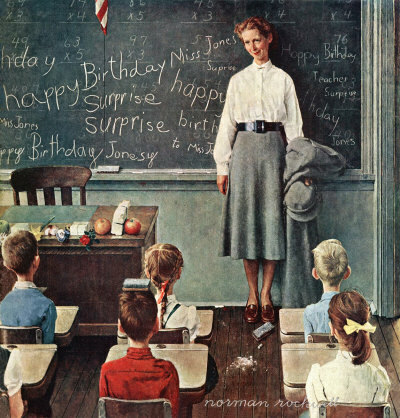 First, the blackboard has been decorated with all manner of "Happy Birthday" wishes for the teacher, Miss Jones. Miss Jones was modeled by Anne Braman. "Surprise" and all the other words are spelled correctly. Next wee see the appreciating smile on the face of the teacher. She loves these kids whether she remembers it all the time or not. Next we take a look at Miss Jones's desk. All manner of presents adorn the front edge of the desk. We can see an orange, an apple, flowers and packages wrapped and tied with string. Happy Birthday Miss Jones was only one of 322 Norman Rockwell Saturday Evening Post covers; Here is the list of Norman Rockwell Saturday Evening Post cover illustrations. The last element of the painting is the school children. They are all seated at their desks like little angels. One of the little darlings has a blackboard eraser perched on top of his head. We do not know why. The reason for the eraser on top of the boy's head may have something to do with the eraser and chalk we see on the floor in front of the teacher. One commentary suggests that this painting is a homage to Rockwell's favorite schoolteacher in his youth, Miss Julia Smith. Miss Smith taught him much and encouraged his artistic talents,. Do You Have A Great Story, Opinion Or Contribution About Happy Birthday Miss Jones?